By LUDWIG VON KOOPA - Team Division victories? Last week, we got a very sweet, dessert-esque taste of how Splatoon 2 Splatfests will work. It's especially delicious because Team Ice Cream won. 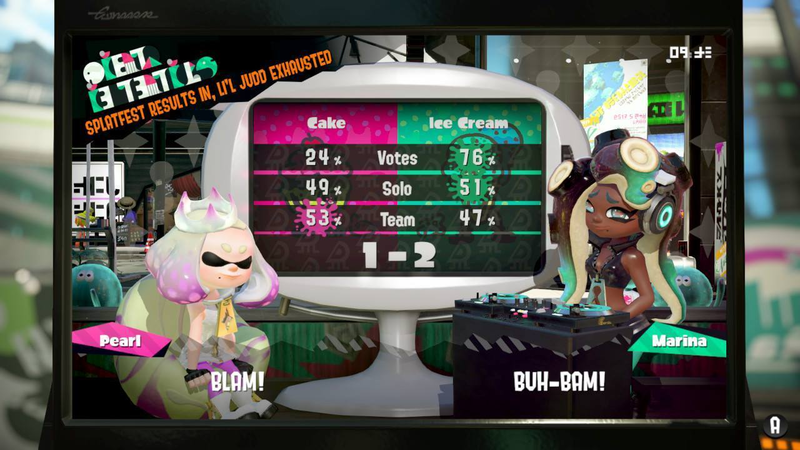 Given how dominating the Popularity score was for Team Ice Cream (76% to 24%), I get the feeling that they actually WON'T re-run this Splatfest. Three factors: Popularity, Solo Division victories, and Team Division victories. If you remember Splatoon's scoring system, it was a function of Popularity and Wins. First, it was Popularity + (Wins * 2), but then the 2 became a 4, and the 4 became a 6. Regardless, percentages always mattered: The scores were a function of the percentage figures. You could be unpopular and still win. Splatoon 2 changes that completely. Let's back up a little bit: There are two ways to play Splatfests in Splatoon 2: Solo Division and Team Division. Solo Division is the old way from Splatoon: You pick it and get matched up with three other random people from your team, and then go have fun, sticking with those people (unless they drop out). Team Division, new to Splatoon 2, allows you to play with Nintendo Switch friends on the same team and have fun together. For whatever reason, Solo Division and Team Division are being graded separately for Splatfests. Now, the winning team is a Best of Three between Popularity, Solo Division, and Team Division. The actual percentages don't matter, as long as it's more than the other guy. Splatoon has therefore moved to a first-past-the-post system, similar to the United States of America. This makes the final results 3-0 or 2-1. That's rather uninteresting, right? I did pretty well for myself as an Ice Cream King. 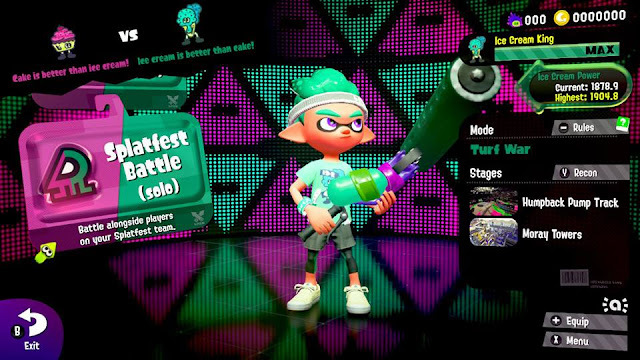 I only did solo Splatfest Battles, as opposed to team Splatfest Battles. In Splatoon, people tried to predict the results ahead of time by trying to demographically anticipate which team would attract the most number of fans, and which team would attract the most skilled players. What do you predict for Splatoon 2? Which team has the best coordination? But teams can't be centrally planned. You can't get everyone in the region who is interested in cake together and get them allocated in the most efficient way to solo or team play. I see it as a commentary on the follies of communism, personally. The most theoretically efficient set-up is to have a central Team Cake Committee that gets the four best Cake players together, puts them on a team in the team division, and then they beat whatever Ice Cream members they're against. After that one win, the Cake Committee mandates it so no Cake player may ever play a team battle ever again. Just focus on winning Solo. Of course, the other most optimal thing is to have those four best Cake players be the only four Team Cake members to play Solo. They'd get matched up together because they'd be the only Cake members on the server. Win once, and don't play Splatfest ever again. Team Ice Cream won Popularity and Solo, while Cake won Team. It was supposed to be 24-76 Popularity, 100-0 Solo, and 100-0 Team, so Team Cake would win. But free people want freedom, and do free actions independently of what the Cake Committee demands. This... is probably why Callie ditched Inkopolis. In the absence of central-planning, if you want to have the biggest impact on Splatfest results, then the team battles are for you. There are likely less people playing in the teams section than the solo section (because the barrier to entry is higher, so most random people won't bother), meaning there will be less teams matches. That means each teams match will proportionally be worth more percentage than solo matches. You just need to find people to play with. Hm, I bet if you keep following KoopaTV throughout Splatoon 2's life-span and read our continuing Splatfest coverage, you'll find lots of talented friends to form teams with! Splatoon 2 is releasing TOMORROW! Ludwig will reserve his actual gameplay feedback from playing the demo Splatfest for Friday's article. For now, looking ahead, how do you feel the Splatfest metagame will develop in Splatoon 2 compared to Splatoon? Here is the Friday article with gameplay feedback! The first real Splatfest once the game releases is on ketchup vs. mayonnaise. 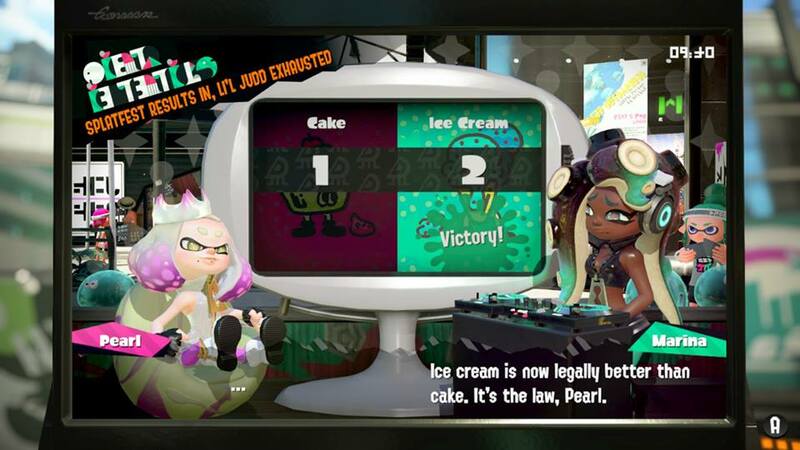 The next real Splatfest goes into the philosophical arguments behind things such as codifying the Splatfest results into law. 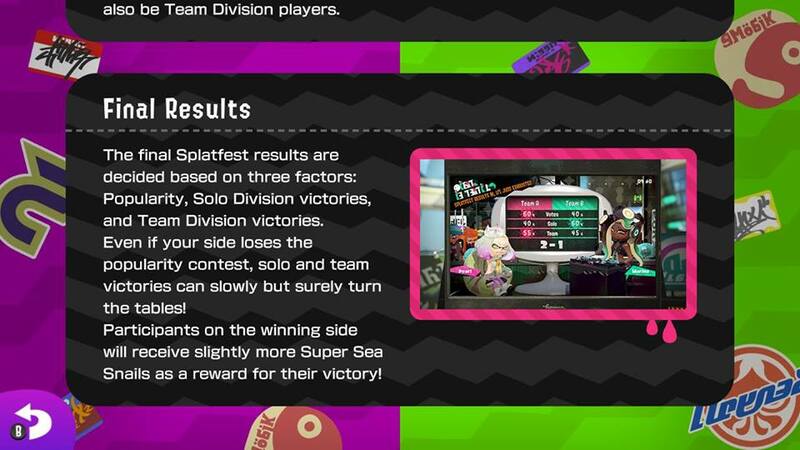 The Splatoon 2 Splatfest scoring system changed again in September 2018. Here's what is different about it. I've been playing Splatoon 1 lateley and I finally reached level 40. I'll probably will not reach the max before moving on to the sequel, but I had a great time playing, especially during the Splatfests. They were some of the most fun experiences that I had playing on the Wii U. I certainly cannot wait to jump back into them whenever I get a Switch. I recently got to level 43 on Splatoon... and won't ever get any higher than that. People are waifuing Marina so hard and hating on Pearl so much for her unconventional female design I would be surprised if Pearl ever gets a popularity win in the West. Pearl is much more better received in Japan as she appeals to them more. Just comes to show you Nintendo usually cares more about the Japanese audience first before the rest of the world. ...Yeah, there's... no way Team Mayo is gonna win popularity. Also I still have no idea how to approach that Splatfest, so thanks to Nintendo for announcing it way in advance so we can try to prep for it. Pearl looks better in motion. ...See, even that's not... actually compelling. So it seems even Japan has Mayo vs Ketchup and aparently Japan loves mayo. Team Ketchup is screwed if each region will play this Splatfest separetly and then all scores will be combined. But is Europe and NA considered separate regions? The English version now shares the same translation and Cake vs Ice Cream combined them. If there were only two regions, then it wouldn't be worded like that. Trump ordered steak with ketchup. So what is this site's stance? Hate Obama and therefore will choose Team Mayonnaise because Obama hates it? Or Team Ketchup because Trump likes it? Will Love Trump Hate? I think wot's gonna end up happening is that I actually have a taste-based preference and I'm going to go with that.